So it is the final day of Tom Barrett‘s challenge. I am not sure whether, for me, it has been a challenge I have succeeded in. Certainly, in terms of writing 28 minutes every day for 28 days, i have not been successful. I missed out days, I doubled up on days, and I often spent more than 28 minutes writing. I teach English. I am a very new teacher of English. This is my second year teaching English to Year 9 students after teaching French and Spanish for over 25 years. I still teach Spanish. For some reason, the fact that I speak English, means that I am qualified to teach it. I have had a very steep learning curve and have spent many evenings and holidays researching how to teach English, how to teach students how to analyse a film or a piece of poetry or a novel, or how to write an essay and give a speech and how to create the wonderful artefacts that are “Static Images”. One of the things that is always suggested to develop students’ writing skills is to write something every day. We are encouraged to get the students to keep a journal and write for a short time every lesson. The problem then is, how do I assess that? How do I find time to read 30 pieces of writing every day and give feedback? Anyway, I tried. I asked them to write for ten minutes each lesson. “What about?” they asked. “Anything,” I said. “But we can’t think of what to write about,” they said. “It doesn’t matter,” I replied. And they sat, and sat. Some wrote frantically, scribbling madly to get their ideas down on the paper. Some wrote bland descriptions of their day; what time they got up, what they ate for breakfast, what they watched on the TV. Some wrote complete nonsense and some, well, they wrote nothing. I didn’t find the exercise a very positive one, and most of my students didn’t either. So I abandoned it and looked for different strategies to encourage writing. One thing I came across when I googled “encouraging writing” was the idea of Story Bursts. These entail writing from a visual or written prompt and rather than limiting the students to ten minutes (which those with ideas found frustrating and those with no ideas found an eternity) I let them have all lesson if they wanted. I also allowed them to write in any form they wanted – they could create memes, write haiku, poems or stories. Different activities were available for those who finished earlier such as reading each other’s stories and commenting on them, reading their chosen book or article, or “Fast Finisher” games such as Boggle, Scrabble or Pictionary. We would have a lesson like this once every month or so and it also became a “Fast Finisher” for those who enjoyed writing. My girls rose to the challenge and although some still struggled with ideas, having a starting point helped get them on their way. They even started bringing in their own prompts! So what has this to do with #28daysofwriting? I think I have understood more fully the difficulties some of my learners had in terms of getting started, thinking of a topic and maintaining a time limitation. Some days the idea of my blog was clear, on others I really had to search for it. When I was tired, it was hard to write coherently (I am not sure I always did!) There were times when the subject about which I was writing was so absorbing that I ran way over my allocated 28 minutes. But I have also had to push myself and found that sometimes the imperative of fulfilling a challenge actually focusses you to do it and if that imperative isn’t there, then it is much easier to give up. I have also learned that it may sometimes be better to not write at all than to write a load of rubbish! So, I apologise for any of my posts that seemed rambly and pointless, but I think they have all been part of my writing journey. Thank you, Tom Barrett for putting out the challenge. #28daysofwriting Days 23 – 27: Gone in a flash! So, this week has been a blur. How is it that some weeks we spend just chasing our tails for them always to be elusively beyond reach? Each evening I sat down to work promising myself that I would find 28 minutes to write. My reward when I finished the tasks I had to do for the next day. I have a habit of looking at the clock in the corner of my computer screen and things usually go like this: I see that it is only 8.30pm. “Yes!”, I think, “I will get to bed before midnight, Plenty of time to write, once I have finished creating this resource, working on this policy, updating this website.” And then I glance again and find to my disappointment that it is already 11.30 and I still haven’t finished. I don’t think I am a slow worker, in fact, I know I am not. But I am not very good at focussing on one thing at once. I get sidetracked, and I know that the internet, social media and emails, don’t help me stay on task. Not to mention books, television and researching where we can do our next training walk or planning holidays. Having a post it note on my screen with the task I am supposed to be doing written on it to remind me that that is what I should be focussing on. They don’t work. Well, they do for a short time but then I get bored of being alone, my mind starts to wander and I open Twitter to see what is happening in the world, Or I get up to stretch my legs, load the washing, take a washing off the line, fold it, put it away, make a cup of tea, load the dishwasher, unload it, clean the kitchen, the bathroom… Not all of these things at once ore even on the same evening, of course but you get the idea of how my work is interrupted. And then I notice my phone, pick it up, see the notifications, look at them and spend half an hour following links from tweets and FB comments. But then, I wonder if I am in the right frame of mind to work? Is the evening after a busy day at school the most effective time to work? I can’t focus fully on work when I know there are so many other things that are competing for my time and attention and which I really want and need to do. Some of my distractions are the realities and necessities of daily life, of motherhood, of family life. I am torn between my family and my work and my play. I wouldn’t be without any of them. But I sometimes wonder how I can get the balance right. Work deadlines, the demands of my students, their parents and school, seem to shout louder than my family. And what ends up giving is my family, my home and me. Not work. Somehow, I have to get better at this whole work-life balance thing. Not sure how. Maybe I need to try to do less, better? Foot sore, muscle weary, tired but a good sort of tired. Isn’t it strange that the sort of tired that comes of being outdoors in beautiful countryside even if you have walked up hill and down hill for 36km in high temperatures is a totally different sort of tired that comes from working all day within four walls of a building? Don’t get me wrong, I love teaching, I love being a teacher. The excitement I still get when kids have that “ahaa!” moment, the interaction in and out of the classroom with students, the conversations with colleagues more than make up for the stress of jumping through hoops but “brain tired” is just never as good as “body tired”. This weekend was our “peak” training weekend for the Oxfam Trailwalk; back to back walks, 17km on Saturday afternoon followed by 36km on Sunday. 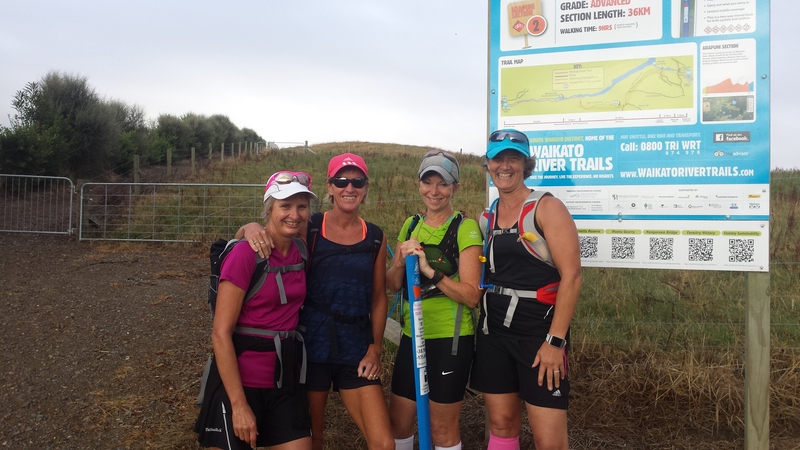 We tried to simulate the actual trail by walking from Waotu South on the Waikato River Trail to Mangakino. 3km down hill to the river and then up and down, meandering along the river bank along the mountain bike tracks. We had a plan to jog the downs and walk the flats and ups and it seemed to work. The river trail is beautiful; leafy, shady bush, soft pine needle strewn paths, the call of cicadas and birds, glimpses of glassy reflective waters through tall trees and a stillness in the air. There is no better way of relaxing even if we were walking at an average speed of 6.5km an hour. 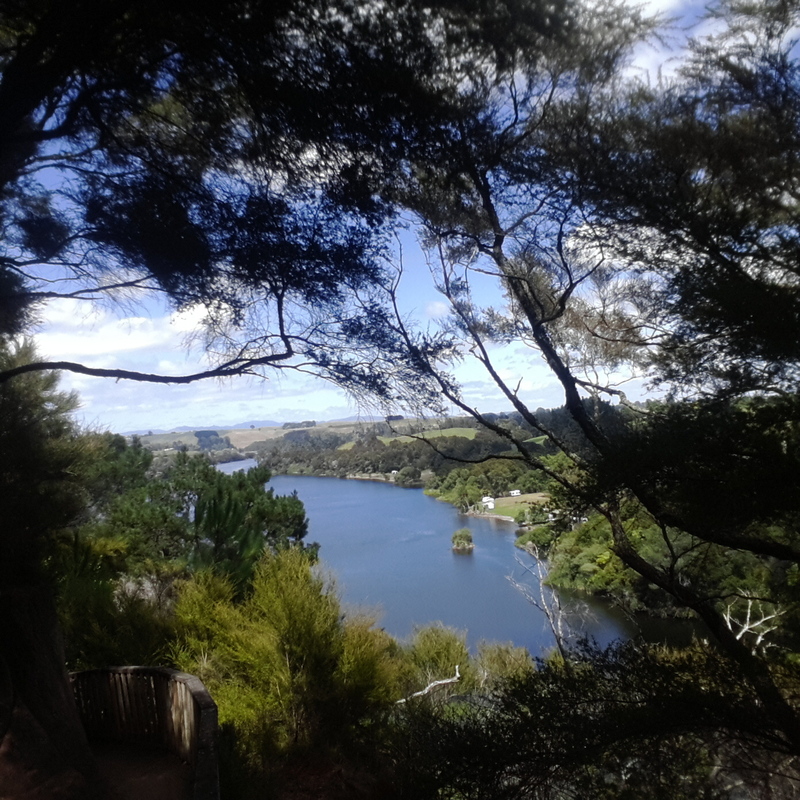 Plunging into the lake at Mangakino brought very welcome relief to our hot, tired muscles and I am still feeling the effects today. But one rest day is all I get, back to it tomorrow! 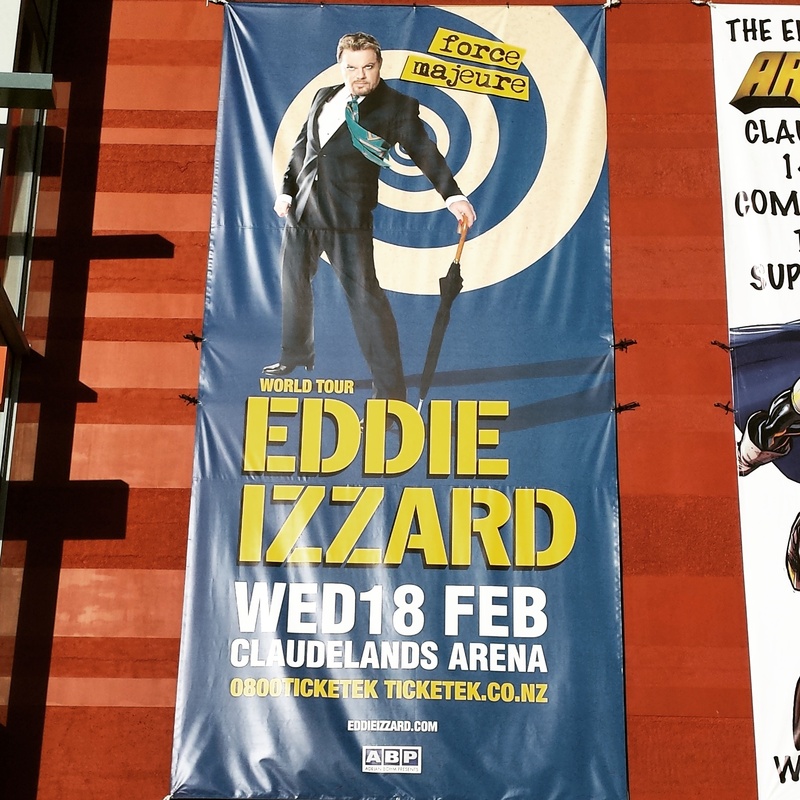 Only 33 sleeps! I love taking photos; my phone is always in my hand to snap life as it goes on around me. I am always on the lookout for interesting angles and subjects that document my life. I am particularly keen on taking photos that make a comment on society. I took this photo because the milk bottle took me back to my childhood when we were given a third of a pint of milk every day at school before going out to the playground for playtime. Being the “Milk Monitor” was a sought after responsibility and the wax paper straws often ended up flat and soggy! I think that the old traditional milk bottles are a lovely shape; there is something very wholesome about them. They are also eco-friendly; once the contents have been drunk, they are collected up, washed and recycled. No plastic dumped in land-fill sites. Maybe we should bring them back? Last week, as I have already blogged about, I was fortunate to work with Dr Helen Barrett, the guru of portfolios. Her wealth of knowledge and enthusiasm and excitement about the power of portfolios for deep learning and personal growth is infectious. We had already decided that we would like to introduce portfolios with our Year 9 students as we implement a whole new cross-curricular junior programme. As we are a GAFE school, it made sense to trial using Google Sites as our platform. The English department have assumed responsibility for guiding the students as they create their sites. I started off with my class asking them what they thought a portfolio was. I asked them where they thought the word “portfolio” came from and gave them 2 minutes to find out. Google gave them an answer but did they really understand it? No! 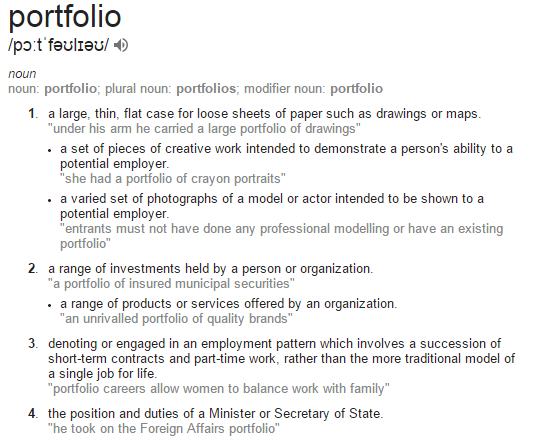 But are these definitions of “portfolio” what we mean in education? 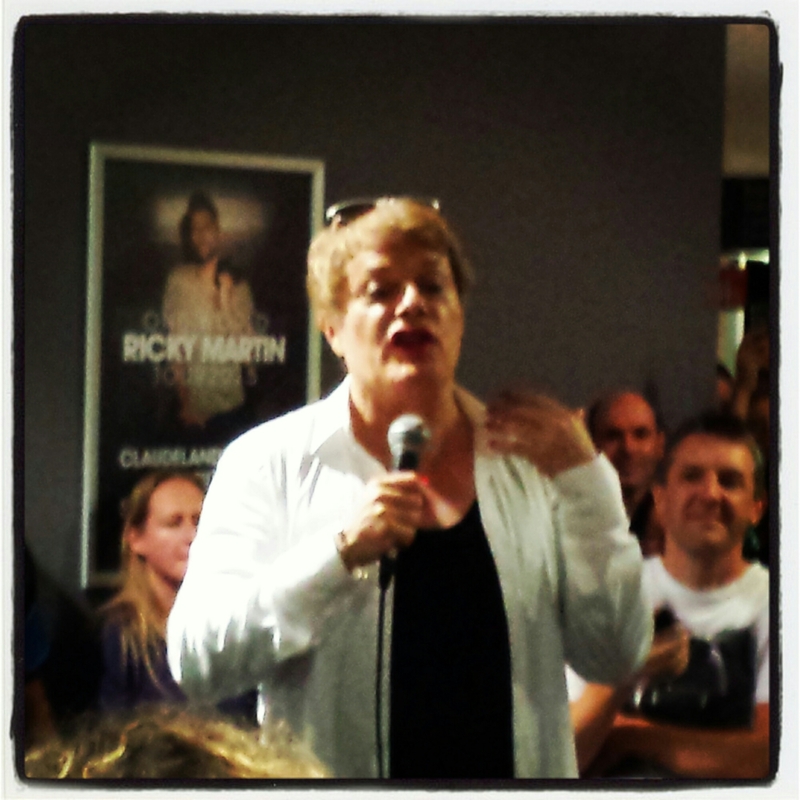 Well, as Helen Barrett says, the purpose of a portfolio is many things to many people. And as technology has developed so has the function, purpose and meaning of a portfolio. The girls then looked to find out where the word “portfolio” came from. But were we any further forwards? Most of them had created portfolios of “best work” at Primary School, they had also “led” student parent conferences at Intermediate school where they explained to their parents, under the guidance of their teachers, what they had been learning. So they had some understanding of what a portfolio might mean for them in terms of their learning. To make it meaningful to them we really needed to explore what they could use a portfolio for, what it would mean for them, how they could have ownership of it. 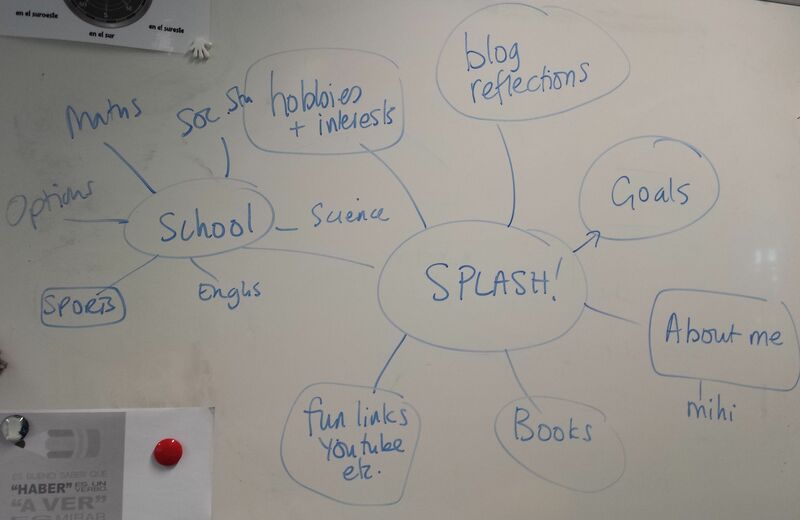 So I asked them to brainstorm ideas of what they could put in a portfolio of their learning. Interestingly, they came up with the same things that Helen Barrett had suggested could be incorporated into a portfolio. I started them off with the idea of a “Splash” page but after that it was all them. We talked about the idea that their portfolio should be all about them, that they could choose what they put there and who they shared it with. Although we also talked about how it may be helpful for their teachers and their parents if they felt they could share it with them for them to have an insight into what they were learning and how their learning identities were developing. I think we have made a positive start. The students in my class were very excited about creating their space. 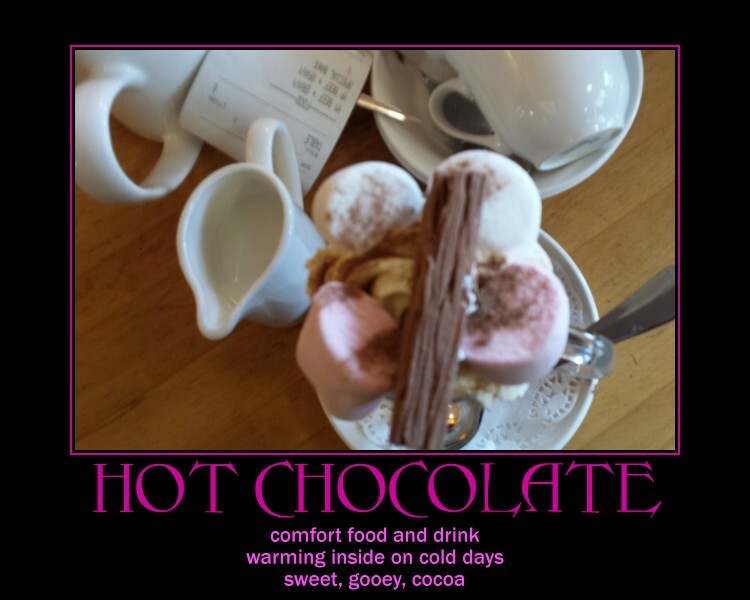 They loved being able to make their sites their own by creating their own themes and colours and adding photos and quotes. In the first few weeks of term we had created our “Mihi” and presented them to the class. They were very keen to embed them into their “Splash” page. I think, though, that we have only just started in our journey of portfolios and our challenge is going to be working out who has ownership of them and maintaining a sense of excitement about them. I am convinced, after talking with Helen, that if they are to be meaningful for our students, if they are to really be a way of making their learning visible, and a way of expressing their identity, then we have to let them have total ownership of them. We must not hijack them and make them a tool of assessment. One of the questions I was asked was, “Will we get marked on what we put in our portfolios?”. My answer was unequivocal, but I am not so sure about some of my colleagues. I said that some of the work they may choose to put in the “showcase” part of their portfolio might have been graded and reported on, but the portfolio itself was theirs. It is their journey, their learning, their identity. It is clear that, increasingly, employers and universities will be looking more at a person’s ability to reflect on their learning, how the experiences they have had affect the way that they learn and the decisions they make, and the direction they go in rather than the qualifications they achieve. I believe we have to encourage good practice and also model it as professionals. I would be interested to hear from anyone who has used portfolios in secondary schools as to how they have worked and whether students have continued with them as they have moved through the school. As usual the school year has started in a whirl, but what an exciting whirl! We took the plunge last year and decided that after two years of allowing students to bring their own devices to school on a relatively ad hoc basis and introducing Google Apps for Education, we would make it obligatory for all students to bring an internet enabled device for their learning. We didn’t mandate a type of device that the students can bring, but we did say that it had to have a screen size larger than 10″ and it had to be able to have Google Chrome as a browser. So that means we have classes with a range of devices from tablets, to Chromebooks, to notebooks, to laptops. The preceding two years were spent enabling our teachers through regular Professional Learning sessions to develop their skills and competency around digital technologies. As well as providing strategies for their use in teaching and learning, some teachers needed to become proficient and comfortable navigating their way around devices on a personal level. We adopted a differentiated approach by offering whole staff training as well as one to one and small group sessions. The administration staff were not forgotten either although, if truth be told, we needed to include them more in the planning. My role in all of this is as the “Elearning Mentor”. I have some allocated time each week in which I can work with individual teachers when they have non-contact time when they are ready to move on to the next step. I also offer drop in “techy brekkies” each week when teachers can come along for some support and I publish “techy tips” on all manner of things. Usually little shortcuts and niggly things that come up in the course of conversations with teachers in the staffroom or in my sessions with them. Over the last few years as more and more students brought their devices and teachers enabled their use in the classroom for learning we have gradually built the capacity of the infrastructure to cope with possibility of more than 1200 devices trying to connect to the internet at any one time. I would like to say that it has all been plain sailing over calm waters in the last three weeks. But it hasn’t. However, it hasn’t been a maelstrom either. 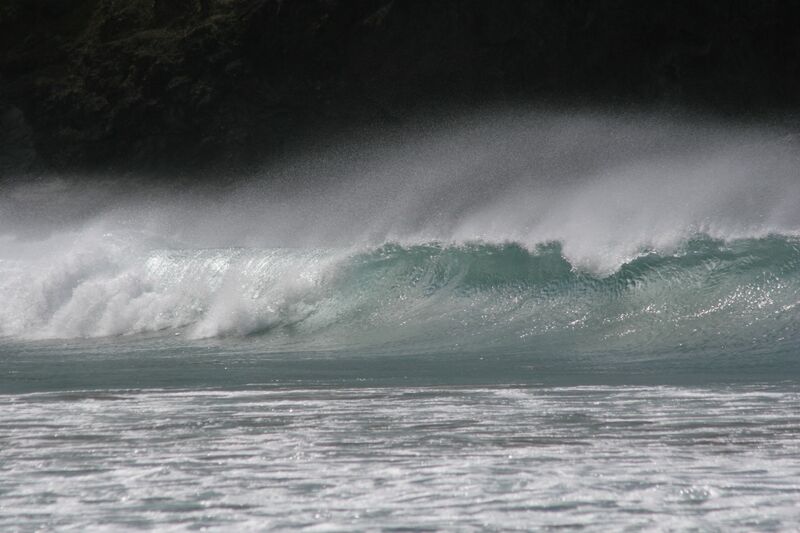 There has been some choppy water, and the odd big wave but I think that is what might be expected. Our teachers have thrown themselves into the challenge wholeheartedly and positively at all sorts of levels. At whatever level is right for them. And the students too, have taken up the challenge, they are creating, collaborating, connecting (just occasionally too much and not always about what they should be, but that is teenage girls for you!) and learning. One of the biggest challenges is for our boarding house. As students have come back from the day school with homework to do online, the boarding house network has not been able to cope with the traffic. Another issue is getting a whole class full of students to upload finished products into their portfolios at the same time. And another is dealing with the different types of media that the girls are choosing to create in and them not really understanding how their own device works or how the app they have chosen works. But they are not insurmountable problems and we have to remind ourselves to take baby steps. We may fall down occasionally but I am heartened by the positive comments I hear and the solutions that are being found. We are all in this together and we are talking and building resilience amongst teachers as well as students. We are “Keeping it Real” and moving forwards, one big stride at a time. Why is it that great ideas come to me in my dreams but then elude my memory on wakening. I had a perfect topic for my blog, I even remember writing it in my dream, but now there are just snatches of swirling half ideas, fragments of concepts floating just out of my grasp. It is that point in the term, 4 weeks in, when my head is crammed with all the tasks that I need to do, all the conversations, emails, lesson plans, photocopying, presentations, that I start to dream about work. So vividly that I am almost convinced that I have actually done some of the jobs on my endless list when I get to school the next day! How many times do you say, “I’m sure I did that!”. Maybe you did, in your dreams. What is a dream? A dream is either: a series of thoughts, images, and sensations occurring in a person’s mind during sleep OR a cherished aspiration, ambition, or ideal. It is thought that the content of a dream is closely related to recent real life events which your brain seeks to make sense of or filter whilst it is resting as a way of clearing and relaxing and coping with life. Given that we live our lives in a whirl and we probably have little time to process during our busy days, sleep is the only time that our brains do have time to do that processing. Recently, one of the questions on the FaceBook group NZ Teachers (Primary) was how did teachers maintain some sort of work-life balance? How did they fit in school, planning, family, exercise, eating healthily etc. As you can imagine there were lots of responses. All of them felt that school dominated, long hours, at school after school, before school, at the weekends. But most talked also about making the effort to create “me” time, “family” time, “brain” time. We can’t keep on going and be effective teachers without providing our brains and our spirits without a space to regenerate. One person added this warning, “Remember Celia Lashlie’s last gift to the world… “I’d waited too long to look after myself and my body broke.”It is tragic, but I have seen too many friends and colleagues “break” because they don’t give themselves a break or they don’t feel that they can take a break given the pressures and the competition in the workplace. I sometimes feel that it is just that – a competiton. Who can work the hardest , the longest hours, start the earliest in the morning, leave the latest in the evening, give the most tutorials at lunchtime . 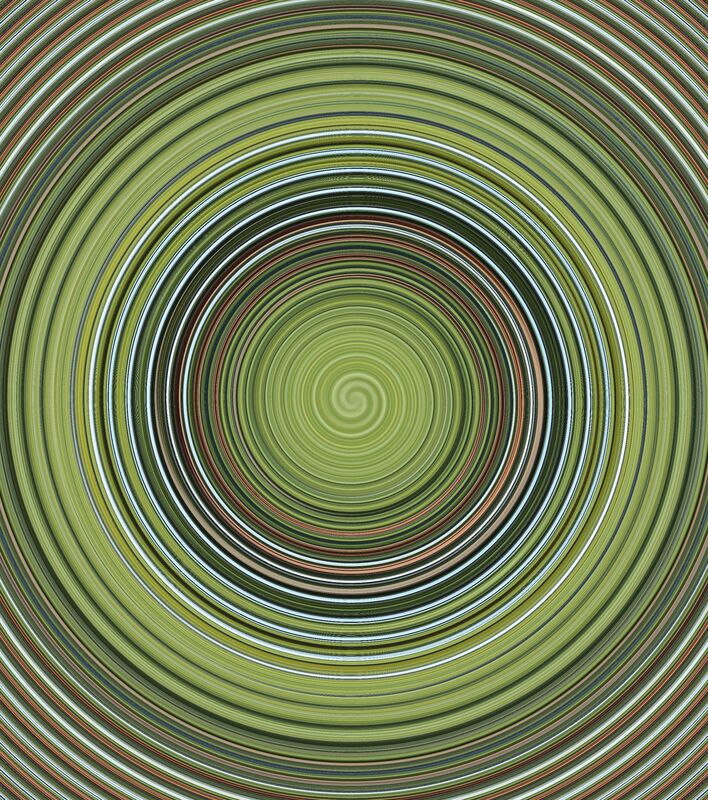 It becomes a vicious circle and it is dangerous. When we don’t give our bodies and our brains time to recover, we get sick, we perform less well, we fail. You owe it to yourself to make the time to relax in whatever way is right for you. Training for the Oxfam 100km has actually helped me regain some balance. Yes, it creates some time constraints but my head feels lighter, I think when I am walking, I talk, I relax, I give my body a break from sitting over a computer, I get fresh air in my lungs and oxygen to my brain. I guess I need to keep that balance once the big day is over! #28daysofwriting Day 16: Progress or backwards steps? 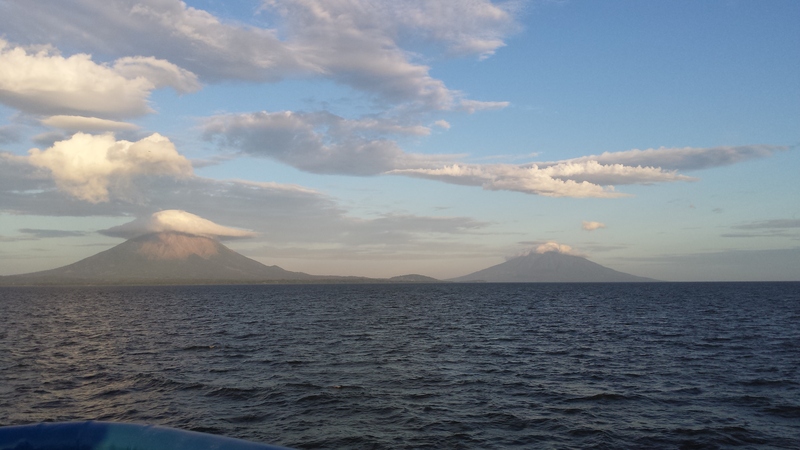 Ometepe Island with its volcanoes Concepcion and Maderas. This Christmas and New year I spent four weeks in Central America visiting Nicaragua and Costa Rica. I have to admit, I knew nothing much about either country except for their location and that they are Spanish speaking. I also had vague memories from my teenage years of names such as the Sandinistas, Somoza, Ortega and Chamorro. Normally, I like to find out quite a bit about a country before I visit, but a serious lack of time meant that I really hadn’t learned much by the time I set foot on the plane on the way there! I think it was actually pretty good arriving there with little or no perception of what to expect. I had a blank slate on which my impressions started to chalk up. No preconceived ideas of the people or the place meant that I took things at face value, listened more carefully to the people to whom I talked and formed my own opinions. It is a cliche to say that Nicaragua is a poor country but that the people are happy. But the people we talked to did seem happy, they make the most of what they have and work hard. One of the taxi drivers who took us from the ferry in San Jorge to Rivas proudly talked about Nicaragua and its people and he even showed us his house! He also showed us where the Spanish conquistadores and Nicaraguans signed the Declaration of Independence in 1821. A cross and a statue mark the point in the road. He told us about how Christopher Columbus came in 1492 and the Spanish stole the land of the indigenous people and drove them out. He was proud of how all the countries that were colonised by Spain have now achieved their independence and their freedom. There is a real sense here of patriotism and pride in who they are; poor but free after the struggles they have had in the latter part of the 20th century. In the Parque Central there are statues of the people from the FSLN who were instrumental in overthrowing the dictator Somoza. It has taken the country many years to get over the damage caused to the economy by Somoza and, whilst the poverty here is clearly evident, systems are in place and seem to be working. It isn’t difficult to understand that the Nicaraguans might want to take any opportunity to improve what they have to continue to make life better for themselves. One such opportunity is a new canal, financed by a Hong Kong company, that will cut right through the country. It is envisaged that it will take the traffic that the Panama Canal cannot and will bring wealth and jobs to the people of Nicaragua. It will also cut through swathes of beautiful countryside, lay waste to sensitive ecological sites and destroy habitats of up to 22 different species. It is easy for those of us in wealthy nations to damn the Nicaraguans for going ahead with such a project on the basis that plants, animals and insects will die when they are really thinking of what is best for the people. 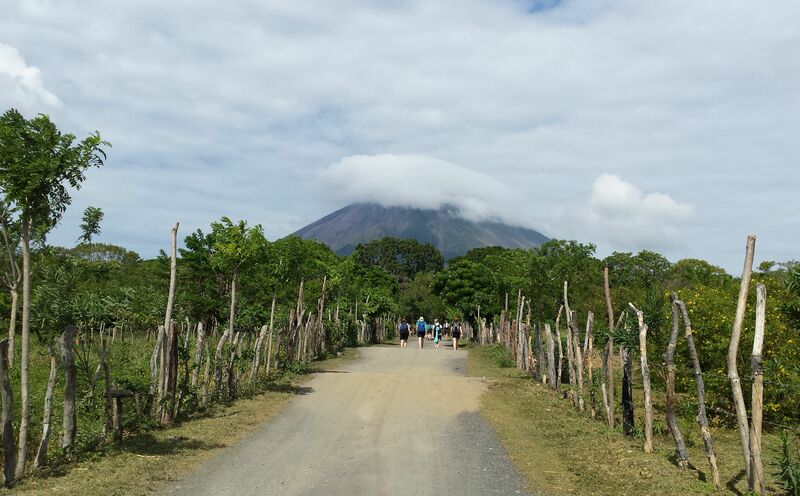 We spent four days in La Isla de Ometepe which is situated in the Lake Cocibolca (also known as Lake Nicaragua). The canal will come straight through the lake to the south of the island. It is a beautiful, clean, impressive lake. It feeds the local communities, it is fast becoming an ecological tourist venue, bringing jobs and opportunities for the locals. It is unspoilt and certainly a haven for world weary western tourists. But is that enough for a people who have been downtrodden for generations and who are simply trying to get themselves back on an even economic keel? It seems though that opinions are split, that the proposal is controversial. There are those who are keen to push it through and those who fear that it could end up being a huge white elephant. In October, San Jorge witnessed demonstrations in the streets against the project. Is it an idea that will bring short term gain and long term loss to a country that has a lot to offer in terms of bio-diversity, especially in a world where eco-tourism is big business and where we are starting to realise what we have already destroyed in the name of progress? These two articles explore further the impact that such a project will have on the country. I encourage you to read them. It has been an expensive day. Buying hockey shoes and football boots for my son. As part of that process, one of the shoe shops we went into scanned his feet to help decide which were the best sports shoes for him. 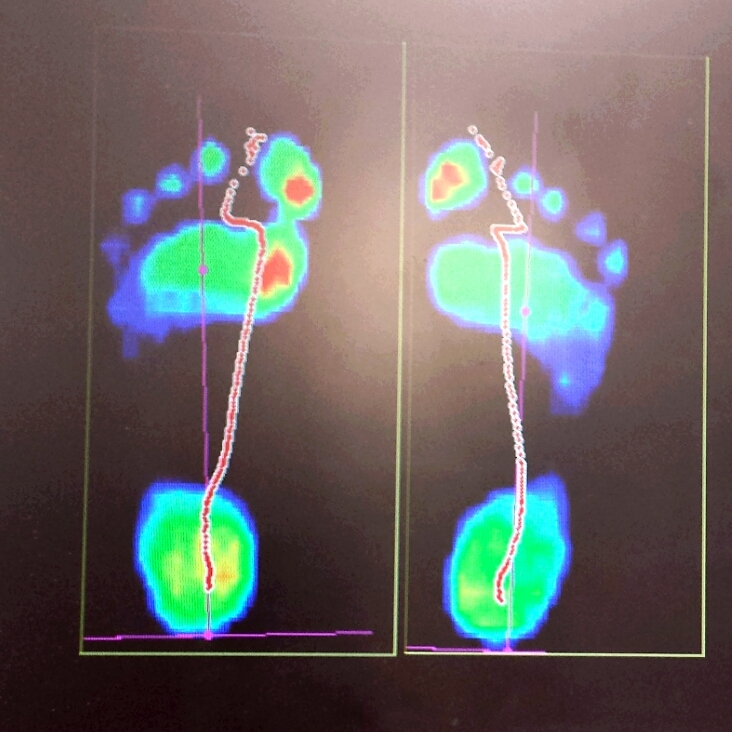 His scan shows that his feet are quite well balanced; the pressure on his foot tracks pretty much identically for both feet and the absence of an imprint between the heel and the toes indicates a relatively high arch. Interestingly, the shoes that the consultant chose for him to fulfil the requirements of his feet are the same as the ones I have for the #oxfamtrailwalk. I suppose it shouldn’t be that surprising since he is my son, but clearly wide feet and high arches and the way we walk is genetic. When I took this photo in La Isla Ometepe, Nicaragua in December it was the sense of symmetry that drew me to photograph it. The volcano, Concepcion, is a magnet and is itself very symmetrical with its classic volcanic cone. It is constantly changing as the cloud moves around it so you never see the same view of it. It dominates the tiny island and I like that this photo draws us to it along the dusty road.